We'll speak with Ferguson, Missouri, Mayor James Knowles on "New Day" at 8am ET. Confrontations between police and residents of a St. Louis suburb raged into the night after a fatal weekend shooting of a teen by an officer. Crowds gathered Sunday night for a candlelight vigil for Michael Brown, whose shooting death sparked tensions in the Missouri town of Ferguson. The peaceful gathering turned tense as protesters hurled bottles at officers and kicked police cars parked on the streets with blue lights flickering. Young men knelt before stoic officers in riot gear, hands up in protest to symbolize surrender. Others looted stores and hauled out items such as clothes, tires and hair extensions. "We will stay out here as long as you (police) are!" protesters yelled. Witnesses said Brown,18, was unarmed and had his hands in the air when a Ferguson police officer shot and killed him Saturday. But authorities said that was not the case. "The genesis of this was a physical confrontation," said Jon Belmar, chief of the St. Louis County Police Department. The local police called in his department to conduct an independent investigation. The Ferguson police officer tried to leave his vehicle just before the shooting, but Brown pushed him back into the car, "physically assaulted" him and struggled over his weapon, according to Belmar. Brown was eventually shot about 35 feet away from the vehicle, the police chief said. He declined to provide more details, saying he didn't want to "prejudice" the case. Ferguson Police said its cars do not have dashboard cameras. Shell casings collected at the scene were from the officer's weapon, Belmar said. A medical examiner will issue a ruling on how many times the teen was shot. "It was more than just a couple," the police chief said. But witnesses issued a different account. They said Brown did nothing to instigate the shooting and appeared to be surrendering when he was killed. Brown was spending the summer in the neighborhood with his grandmother, Desuirea Harris, she told KMOV. "My son just turned 18 and graduated high school and he didn't bother nobody," his mother, Lesley McSpadden, told CNN affiliate KSDK. Brown was supposed to start classes at Vatterott College on Monday, she said. Antonio French, an alderman in nearby St. Louis, said the community is outraged. "People have a lot of anger and are frustrated," he said. "They don't have recourse in the system, and it happens often in this country, and it has boiled over. I think people are angry and looking for a reason to let it out tonight." Could the death of Eric Garner, the man who was held in a choke hold and died while police attempted to arrest him, look awful but still be lawful? That's what New York City Police Commissioner William Bratton thinks. In an interview with Chris Cuomo on "New Day" Monday, Bratton said despite the video appearing to speak for itself, it does not. "We have the expression it– it looks awful, but it's lawful," he said. Bratton outlined that the district attorney will determine if any of the actions of the officers involved were illegal and he will investigate if any of the actions were inappropriate. After a back and forth about the term 'choke hold,' the commissioner restated his skepticism. "I've been around a long time in this business that– what it appears to be sometimes may not be what it is," he said. Police are investigating the shooting of Michael Brown, 18, by an officer in Ferguson, Missouri. 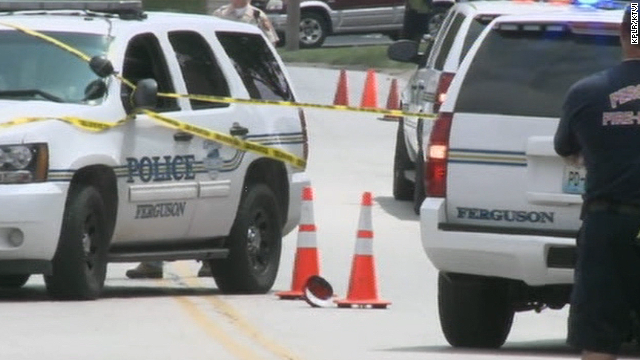 A Missouri community is outraged after an officer shoots a teen. West Africa scrambles to stop the spread of Ebola. And Iraq reels from humanitarian and political crises.